Sofia is a Washington state native, but was lucky enough to stumble upon classes at the Mothership in 2008. 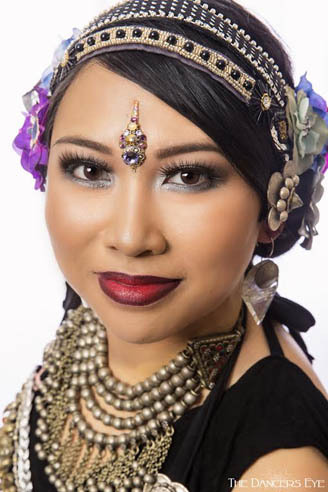 She received her General Skills and Teacher Training certifications in 2015 and is honored to be a member of the FatChanceBellyDance® Teaching Collective. Before beginning her ATS® education, Sofia studied and performed Egyptian cabaret under the direction of the esteemed Nanna Candelaria. As a cabaret student, Sofia was terrified of dancing solo—you can imagine her delight when she discovered an entire dance form committed to group improvisation! Once she caught the ATS® bug, she never looked back. Sofia was immediately enraptured with the ATS® aesthetic and appreciated how the rules impose order on chaos to create limitless possibilities. She is committed to continually improving and refining her skills and performing classic ATS® at its finest with FCBD®. Sofia also enjoys exploring the freedom within these boundaries as a founding member of Tessera Tribal, an FCBD® studio troupe. When she’s not dancing, Sofia is an attorney, cat wrangler, avid maker and eater of pies, fan of RuPaul’s Drag Race, karaoke enthusiast, and a novice tropical fishkeeper. Photo courtesy of Don Labit DESIGN.